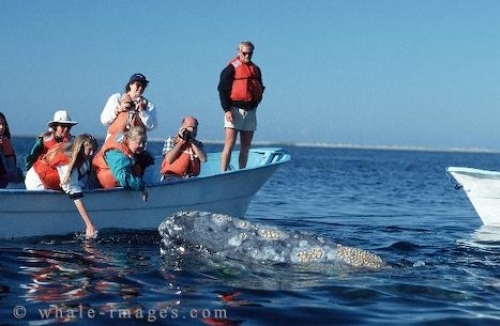 Baja Boats - Gray Whales - Eschrichtius Robustus, Baja California - Mexico. I watched as this barnacle covered gray whale approached the baja boats. Steady at first and curious, then dove away as though to shy. Seconds later the head of the gray whale popped up right beside the baja boats much to the joy of the occupants. Almost immediately the tourists onboard tapped the surface of the water with their hands to encourage the whale to come to them, and this obliging whale did just that. Picture of small whale watching boats and tourists watching a Gray Whale.